Overwhelmed by your caring, your thoughts, prayers, words, comments. Non-bloggers have no idea what all this fuss is about. Friends on every continent. Sitting in my sofa in a Nordic House in the Woods, far away, still close enough to be hugged all through the day from world wide friends. It was not easy to write yesterday´s post. In the end I almost deleted it. I am glad I pressed the post it button instead. Glad I found the courage to share my vulnerability, my tears, my anxiety. My nose is healing. When I went to bed last night I laid for a long, long time. Didn´t want to go to sleep, wanted to wrap myself in the lovely feeling of breathing freely through my nose. Breathing, air to fill the lungs, the brain, the heart. That´s what my panic attacks have focused on. Or at the edge of panic attacks. I am lucky, I have never really been inside an attack. Many years ago a friend of mine, a young mother of two small boys, a wife, died of lung cancer. I´ve always thought it must be the worst death there is. Not being able to breath. My last days have had detours to Japan. My brother Børge, the one who wrote the blog post about the creation of new land in Iceland, came with a beautiful bonsai. Jane and Lanny, the Californians who spent three weeks with us this summer, brought several gifts when they arrived. Among the gifts were two Japanese flower paintings, bought by Jane´s parents when they lived in Japan when Jane was a girl. I look at the paintings every day, admiring them, loving them. I plan to have them framed and hung in our hallway. To be seen, admired, loved by me and by all who enters The House in the Woods. I am feeling better today. We are invited to my parents for dinner, at this time of the year it is time for lamb. 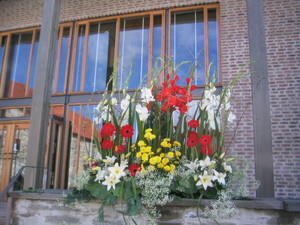 Before that I might........well, I don´t quite know yet, but I feel fit and ready to embrace life, very carefully. During my three weeks in India in 2008, I spent time every day on Carolyn and Hossy's terrace, talking with Carolyn, writing in my diary, painting and reading. Mostly reading. What a pleasure it was to come to this house filled with books, and what a pleasure to find a kindred spirit according female travel litterature. I digged deep into Carolyn's book shelves, and while staying east of the sun, west of the moon, far from little Norway, in my mind, through Carolyn's books, I kept on travelling, east and west, north and south. I have collected female travel litterature for the past 9 years, ever since I discovered its heaven in the bookstores of New York when I in October 2002 spent two weeks there as an observer at the UN General Assembly. I could hardly carry my suitcases when I went back home from there, and ever since my collection has been growing. In Carolyn's collection I found dear old friends and also travel writers new to me. Like Isabella Bird. Carolyn's terrace and Isabella Bird's travels in Japan go perfectly together in my mind. I can't think of one without the other. Carolyn and Hossy have lived in Japan for many years, and now and then I let Bird's books rest in my lap while listening to Carolyn's tales from their years there. For me it created a dream........to travel to Japan. I was in Oslo yesterday, for a day trip, and sat on the airport train when the devastating news from Japan reached me. Today my thoughts and prayers go to Japan! In a small corner of our livingroom I have gathered some travel memories. I look at the items and my mind wanders to Eritrea, to Laos, India, The Dominiac Republic, Italy........and today most of all to Haiti. It was October 1998 and I was asked by Norwegian Church Aid to go to Haiti and The Dominican Republic for two weeks together with a small group. 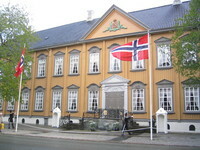 The goal was to bring back information to the churches in Norway in connection with Norwegian Church Aid's annual Lental Campaign. It was my first travel out of Europe, I left Terje home alone for two weeks with four kids, the youngest one, Marta, only 2 1/2. But the most exciting and kind of frightening part was that we were going to visit a country only days after Hurricane George which killed over 400 people and destroyed 80% of all the crops in the country. I am sitting here with my travel diary from the two weeks. A diary filled with strong impressions, with memories when I wanted to close my eyes and take the first plane back to Europe, but also memories of a beautiful, strong, fighting, though shy (in my eyes) people. We divided the two weeks between Haiti and The Dominiac Republic, and most of out time in Haiti were spent in Port au Prince. In a small, charming hotel with a swimmingpool where we could rest between our meetings with people and organisations. There I could pray for the children we met at the orphanage run by The Salvation Army, there I could cry out my "why" to God after seeing the sufferings in the prison we visited downtown, where prisoners lived for years without trials, without hopes. There we could laugh and cry, sleep and eat.......though most of my nights were filled with thoughts and prayers rather than sleep. And there I could linger on sweet memories from a night at Hotel Olafsson, where Graham Greene sat his novel The Comedians. One day we drove out into the countryside, where the hurricane had done severe damage. We slept overnight at a guesthouse and I spent the whole night listening to the strange noises of a world so completely different from my soft security at home. I am reading my travel diary tonight, and my thoughts go to the people of Haiti. Right now they are in need of almost everything, and we can all help. Norwegian readers, you can read more at Norwegian Church Aid's pages, international readers, please find the way your country (through UN, Red Cross, CARE and organisations like them) is giving their support. Already when I came to work this morning people were busy praparing this important visit. Trondheim is very proud to be host city for the emperor and his wife, and alot of work has been done to show the best parts of our city. This first pictures shows the stairs outside the new part of the Archbishop's Palace, where I work in the third floor. We always have flower decorations on these stairs, but never as beautiful as these ones. Can you see that the colours are taken from the Japaneese flag. The woman creating this design was working on it when I took the photo, but she didn't want to show and is hiding behind the huge flowers. Before luch I took a walk in town, it is always so much fun to breath the activity when something big like this is happening. Outside "Stiftsgården" young med from the King's Guard were parading. Torgeir, our oldest son, was part of this Guard two years ago. It made me so proud to watch these young Norwegian men. 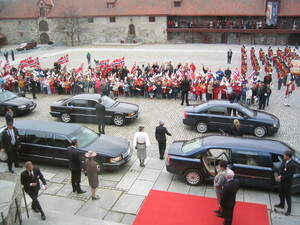 Stiftsgården is where the Royal Family stay when they are visiting Trondheim, and so they will this time as well. The Emperor and his wife will stay at our most exclusive hotell though, sorry no picture from that. 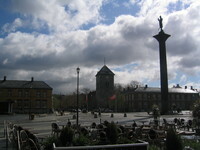 Next is a picture of the huge market square, Torvet, downtown. With a glimpse of Vår Frue kirke, Our Lady's church, Trondheim's Notre Dame :-) in the background. 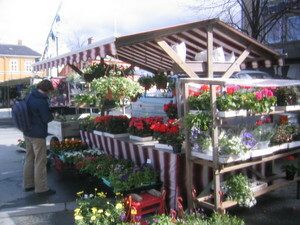 The flowermarket where I bought flowers yesterday is to the right of this photo. 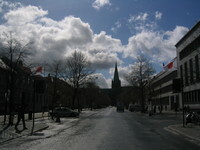 And trurning right myself, and walking a few meters I can see the Nidaros Cathedral. The Archbishop's Palace is right behind the cathedral. Back in my office things started to happen. My office is in the second floor, right under the roof, but through my window I get a small glimps of the "piazza" outside. And I used the opportunity to take loads of photos. A brass band from one of our local schools also came, and I opened my windows to hear the music clearly. When the more prominen guests came I went down to the first floor where there are huge windowns and also many of my colleagues were already gathered. And from here we had the most perfect view of the emperoe, his wife, the Norwegian queen and the Norwegian prince. Unfortunately the Norwegian princess Mette Marit couldn't come. She is pregnant and didn't feel very well. Here you see the emperor and his wife greeting the people, many of them school children from Trondheim with the Japaneese flag. Behind the couple is our Queen Sonja and Prince Håkon Magnus. The Emperor of Japan is in Norway for a four day visit. He started in Oslo, but will also spend two days in Trondheim. On Thursday he and his wife, and the Norwegian queen Sonja, princess Mette Marit and prince Haakon Magnus, and of course alot of official guests, will have lunch in the Archbishop's Palace. Yes, you are right. That's where I work. The room where they will eat is in the old part of the buildings, and after lunch they will go to the Archbishop's museum. On their way there they will walk through our offices!!!!! The Norwegian royalties will even use it for a place to rest for a few minutes, the emperor and his wife will get another room for thie break. But we are not allowed to be there then :-( So work will finish early. I do hope to be able to take a few photos and will keep you all updated. Trondheim is busy now making all ready for the important visit. I took a walk downtown after work today, and loved watching all the activity.